Diana chose Champagne coloured cz's in 3 descending sizes for her new Triple Helix Piercings. This piercing was done with internally threaded surgical steel labrets with prong set cubic's. For 6 of these, there are a few factors that can alter the pricing. The approximate cost would be $616+HST. 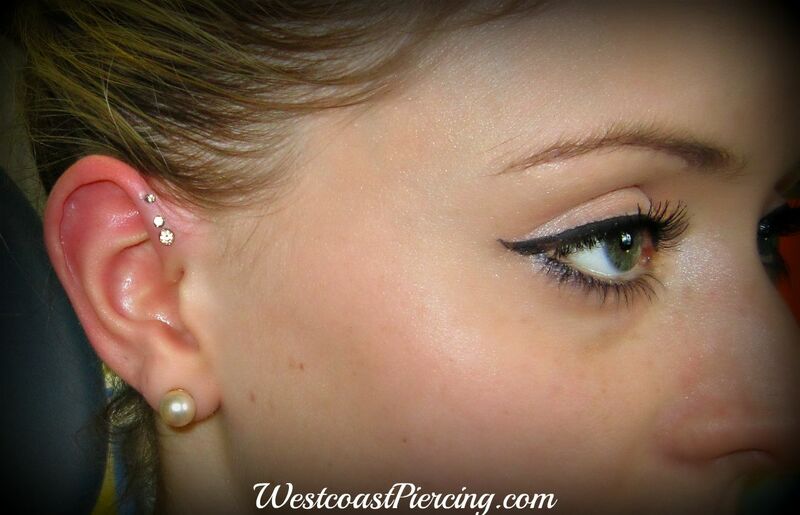 If it was done on one of our 2 for 1 piercing days, the cost would be about $513+HST. 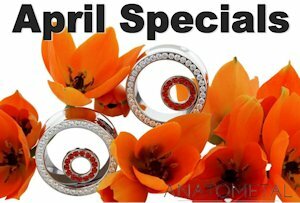 We often have promotional days that could be an advantage on multiple piercings. These special days are listed on our "Upcoming Events" page and our Facebook Fan Page. Feel free to call or email for further information. The jewelry in this picture are internally threaded labrets with prong set cubics. There are a couple of different promotions that could change the price. You are looking at approx. $514+HST. For further information, feel free to give us a call or email. How much does it cost just for 3 ? And can you get them all in the same day? The price is listed as above and yes you can get them done on the same day. Why are the bottom two so close together? It is not the best picture of this piercing. The jewelled labret on the centre piercing was leaning down a bit in the picture. (Just not a good pic) They are all the same distance apart. i love this! how does it work in the back, r they like mini barbells? or is it 1 solid peice? whats the cheapest i could get this for? i would only want the 3. should i come on a special day. whats this called? The jewelry in this picture are internally threaded labrets with prong set cubics. There are a few different promotions that could change the price. If you were to do the piercing on Titanium Bling Day, you would only pay the jewelry. 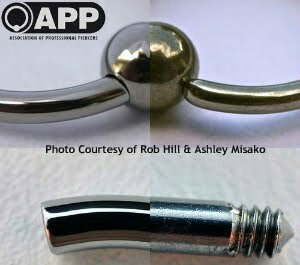 (Piercing is free)Which in Titanium, costs about $225 plus tax. 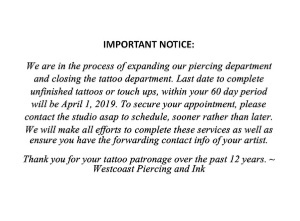 If this was to be done on your birthday, you would receive 50% off of the first to piercing fees and regular pricing for the third piercing fee. So it would be a total of $90 for the 3 piercing procedures and $225 for the jewelry. For further information, feel free to call the office, or email. how much would it cost to only get one forward helix piercing done? It depends on the jewelry you choose. We have hundreds of jeweled options, or you could opt for just a ball. This piercing can also be done with a captive bead ring.